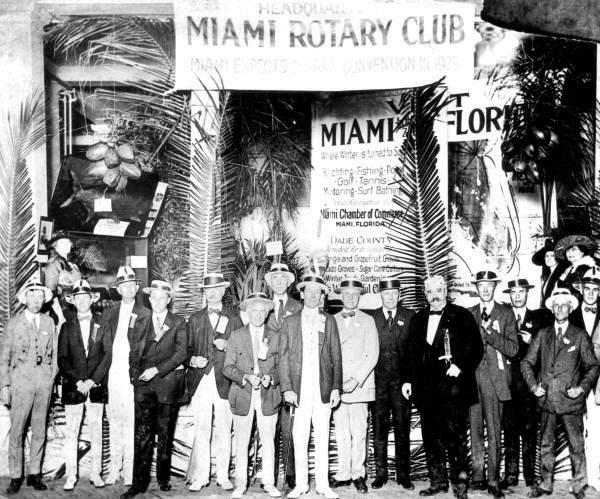 The Rotary Club of Miami Welcomes You! 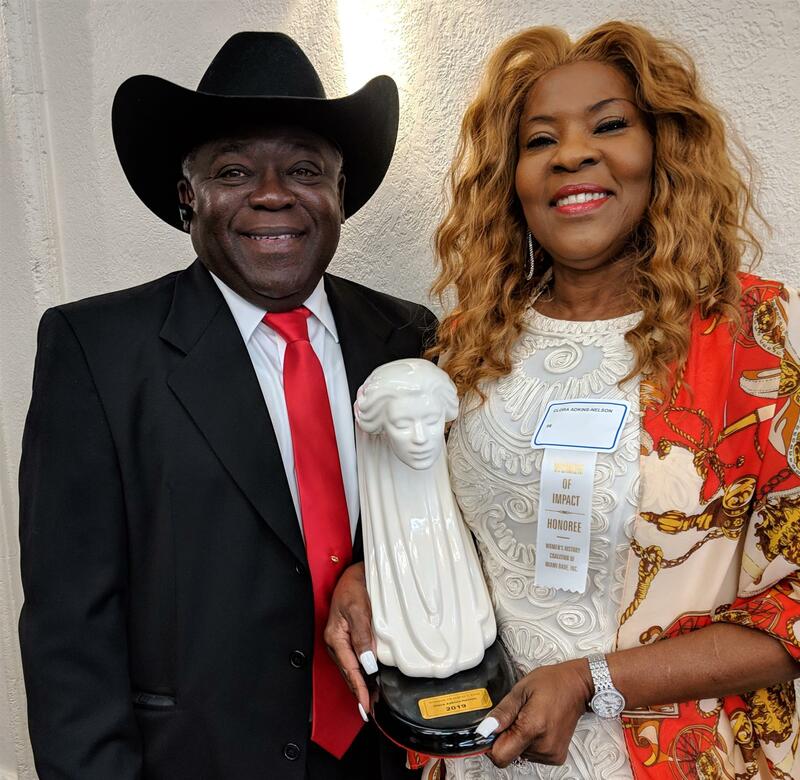 Percy Nelson & Clora Adkins Nelson with the Women of Impact Award, presented to Clora by the Women's History Coalition of Miami-Dade County, Inc. for her work in promoting human trafficking awareness. 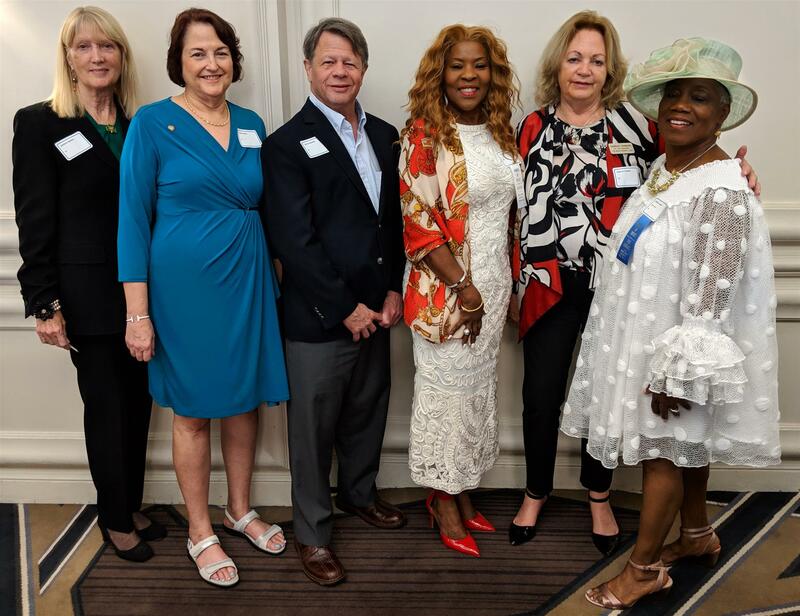 Miami Rotarians Noreen Timoney, Linda Singer, Dave Skinner, Clora Adkins Nelson, Shirley Pardon and Honorary member Priscilla Dames-Blake gathered to recognize Clora's selection as a Woman of Impact. 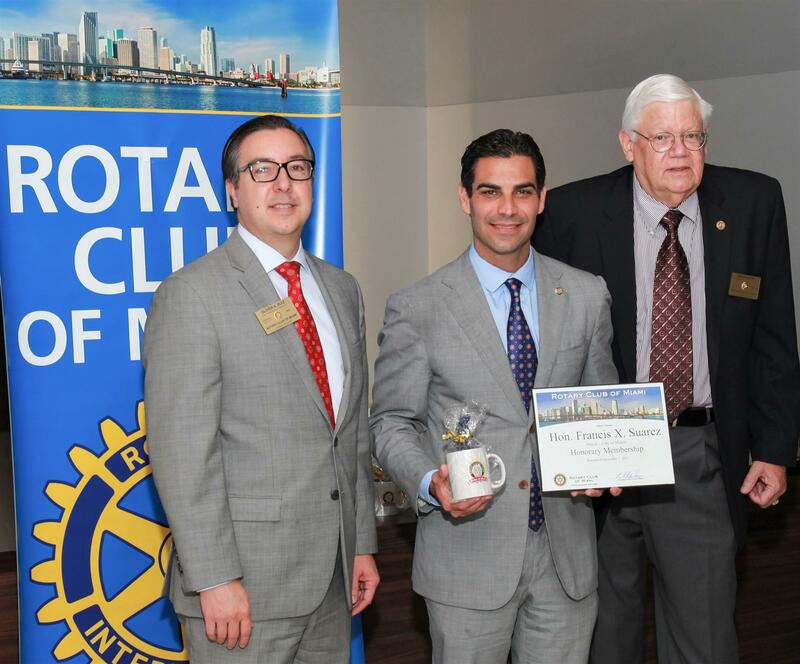 Miami Rotarians are presented with their Paul Harris Fellow awards. 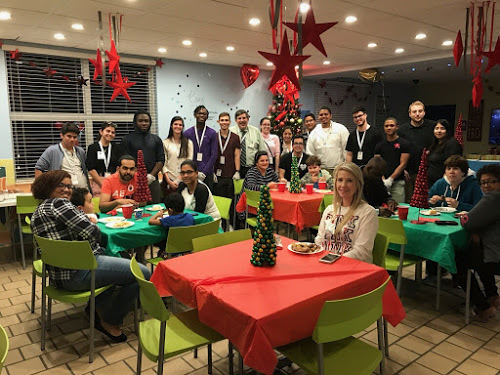 Miami Dade College Rotaract members and Advisor Randy Lichtman serving dinner to families at the Ronald McDonald House. 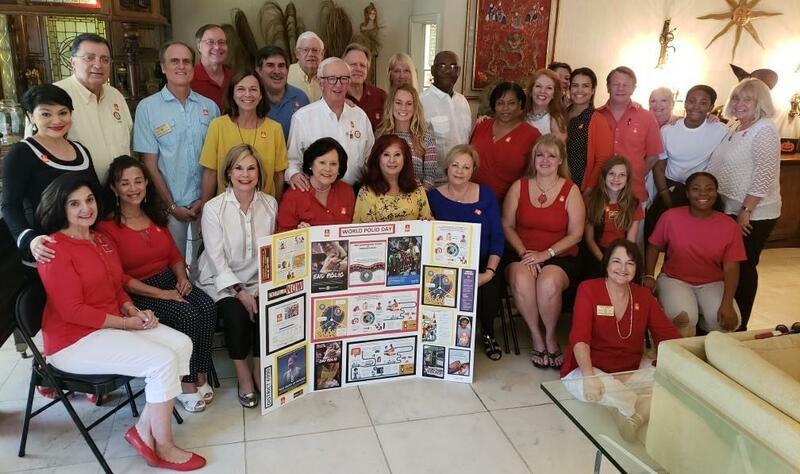 Rotary Club of Miami and Miami Rotaractors walked to support the American Heart Association's life-saving activities. 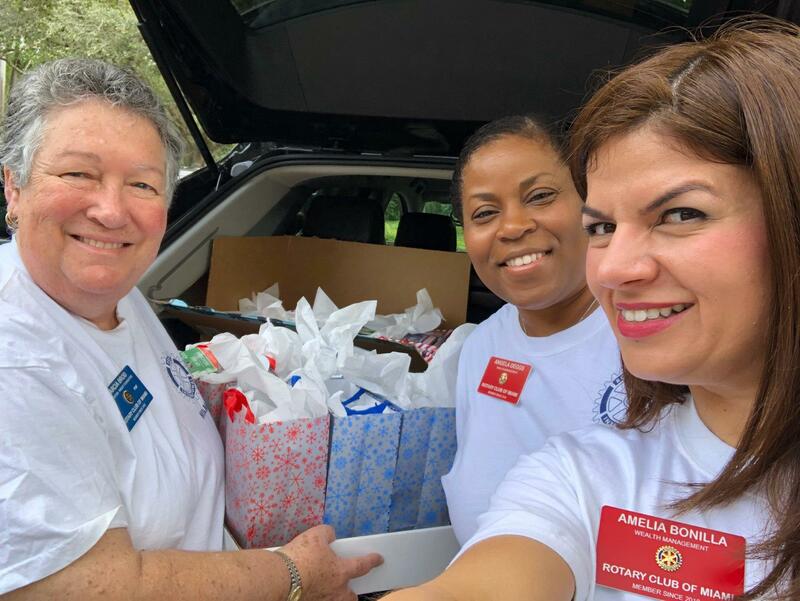 Marcia Brod, Angela Deggs and Amelia Bonilla deliver supplies for the families at Inn Transition shelter. Norby Rudel also participated. 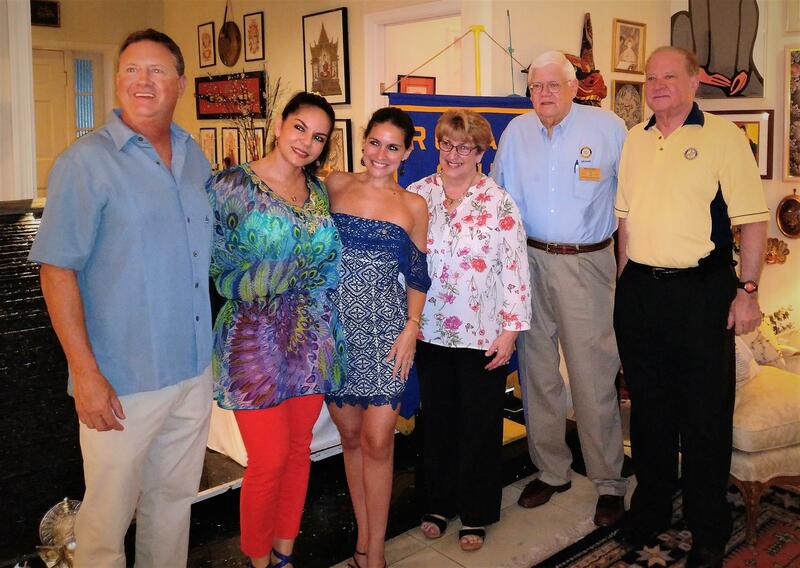 The Club hosted a “World Polio Day” brunch on Sunday, October 28. The brunch was a wonderful success with 50 members and guests. 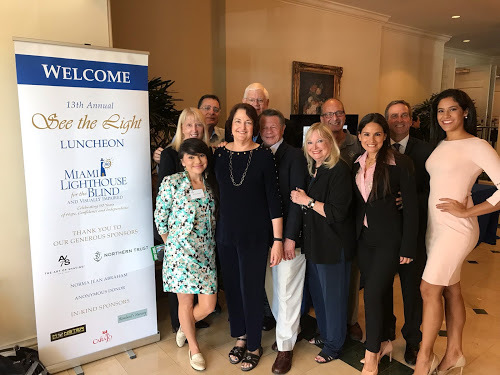 On Thursday, October 25, President Dave Skinner, Linda Singer, Phil Seipp, Noreen Timoney, Robert Bull, Rick Miller, Bunny Uriarte, Karla & Scott Richey, Jessica Almeida and Diane Landsberg attended the “See the Light” luncheon put on by the Miami Lighthouse and our members Virginia Jacko & Cameron Sisser. 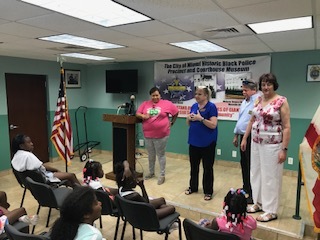 We are proud that our club was one of the founding forces of the Lighthouse, and we will continue to support their excellent work. Past President Phil Seipp turns the wheel over to President Dave for the 2018-19 year. 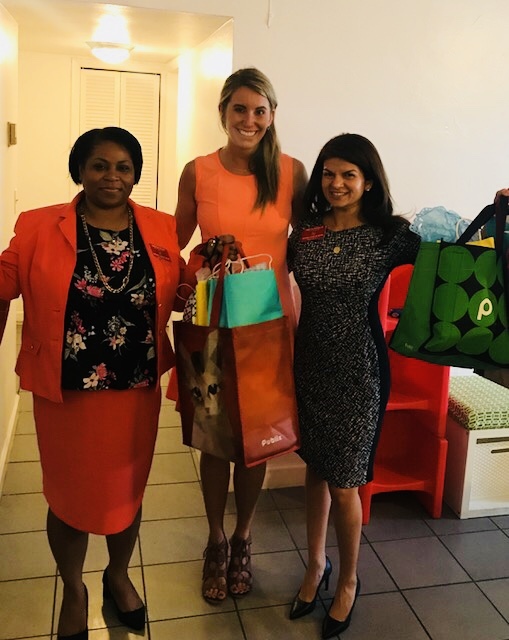 Angela Deggs and Amelia Bonilla purchased and delivered supplies to the women's shelter. 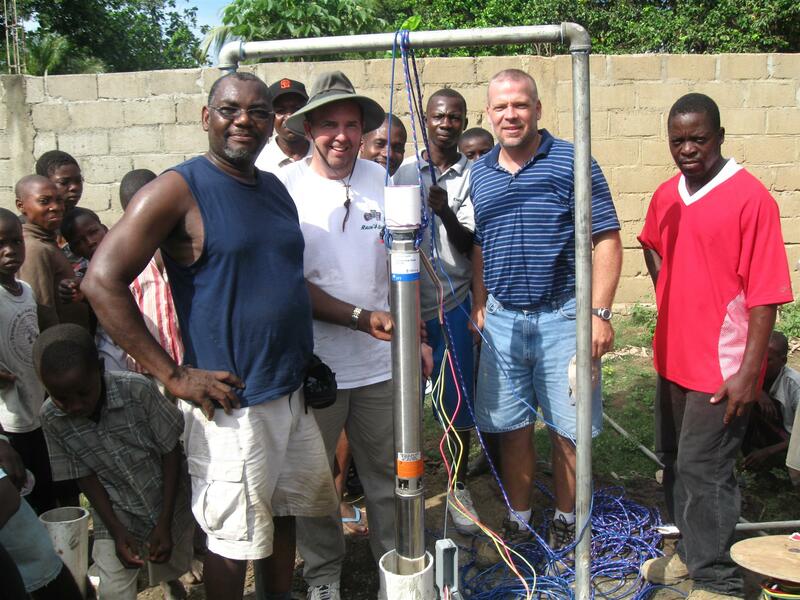 Rotary Club of Miami's own Renel Noel preparing to install another well pump to provide safe, clean water in Haiti. Click for more photos and slideshow. 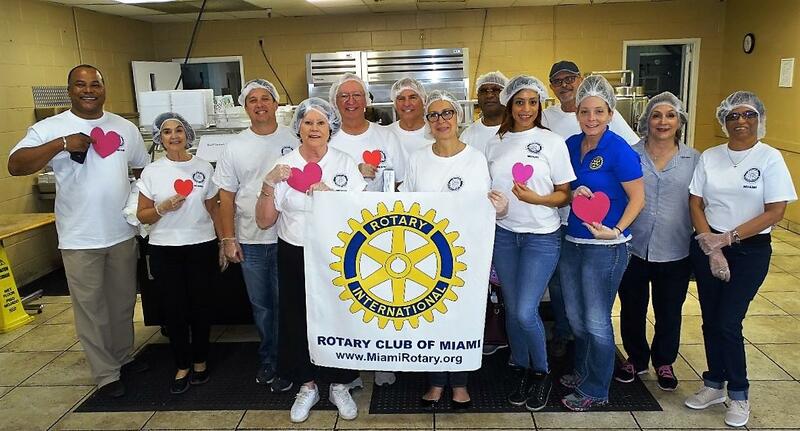 Some 16 Miami Rotarians gathered to serve a Valentine’s Day lunch to 500 people at the Chapman facility for the homeless. This was a project spearheaded by our “Red Badgers” who showed their community service spirit. 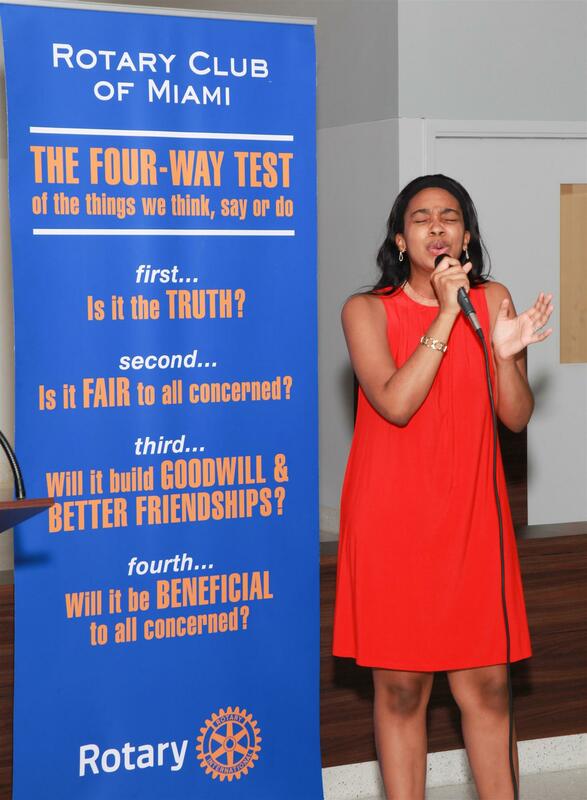 The Star-Spangled Banner was performed by Kelly Woodson. We've been doing this a long time. Love those hats! 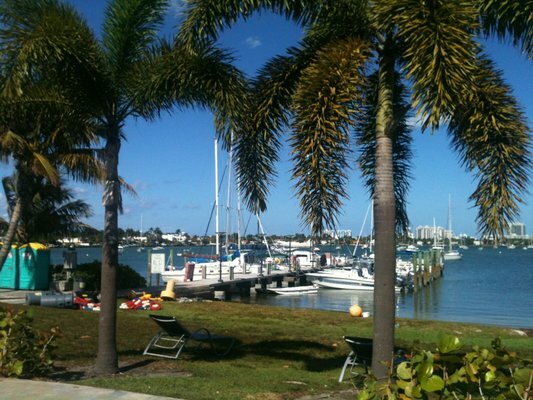 Thanks to all who contributed on Give Miami Day! 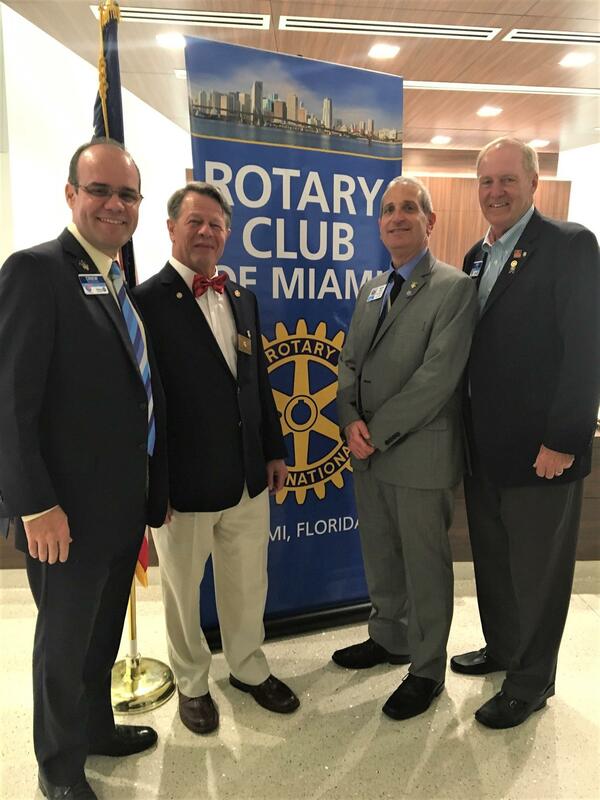 A very big "Thank You" to all who contributed to our Rotary Club of Miami TBM Medical Scholarship Program on Give Miami Day 2017! Your gifts make it possible for us to provide more support to more amazing medical school students who graduated from high schools in Miami-Dade County. 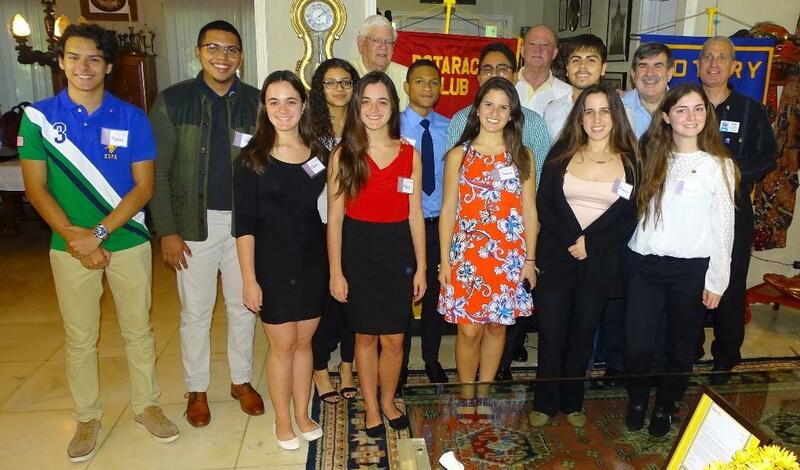 A pinning ceremony was held 10/29 to officially induct the first 12 members of the new Rotaract Club of Downtown Miami at Miami-Dade College. 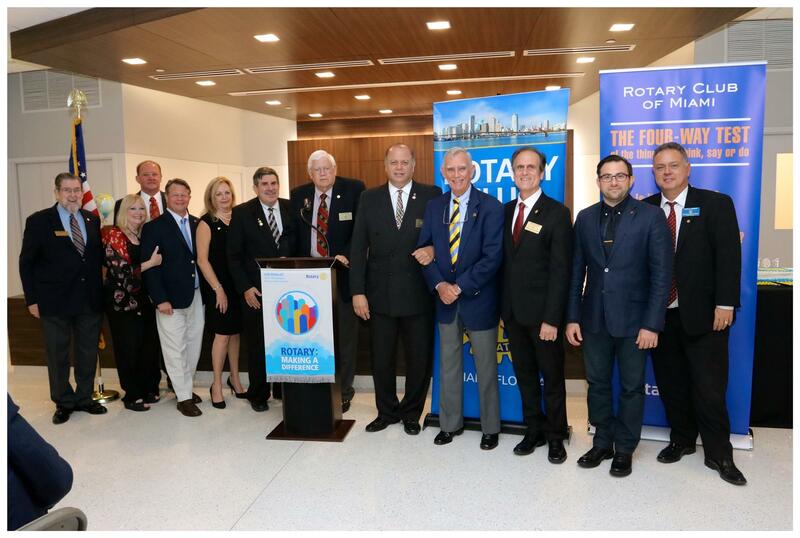 29 Miami Rotarians together with District Governor Alan Cohn were present to help launch this new Rotaract Club. 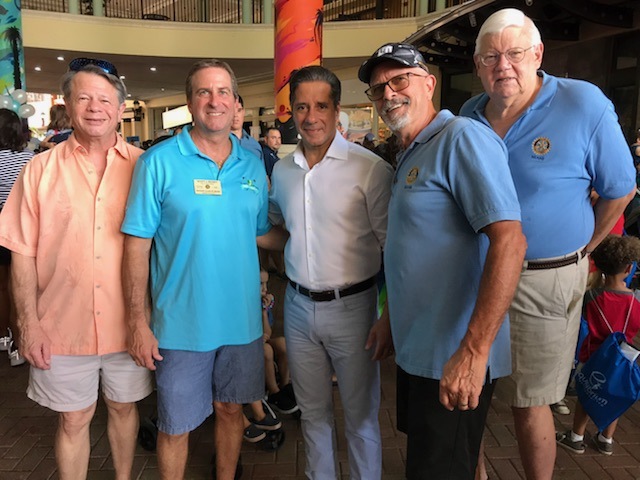 Also pictured are Phil Seipp, President of the Rotary Club of Miami, Randy Lichtman, Youth Services Director and Club Advisor and Past President Dave Anderson, event emcee. 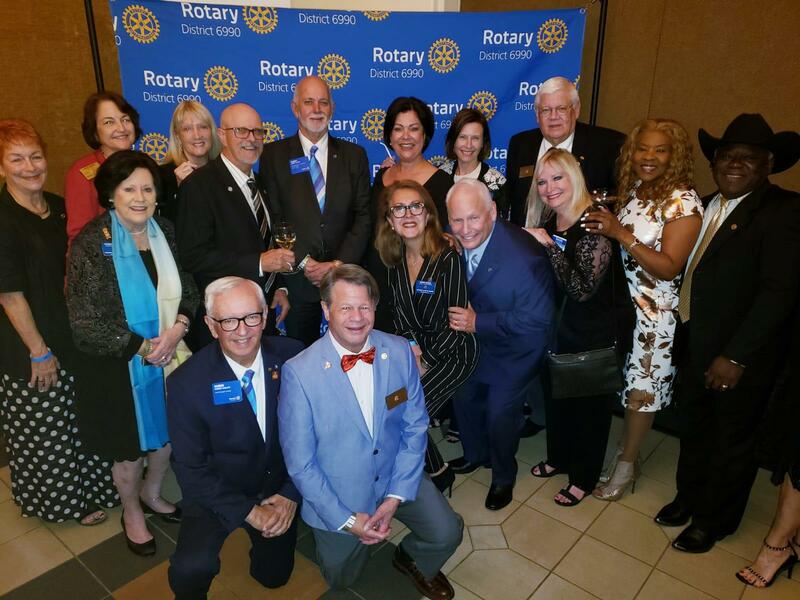 2017-2018 Rotary Club of Miami President Phil Seipp gavels his installation dinner to a close. President Phil introduces his 2017-2018 Board of Directors. 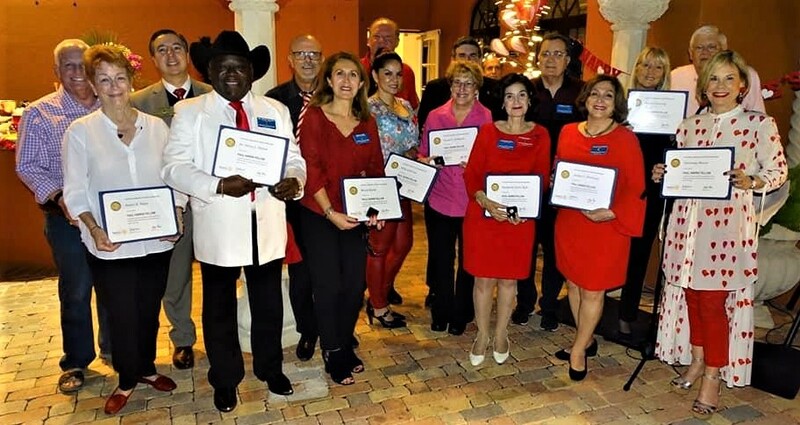 Congratulations to new members of our Rotary Club! 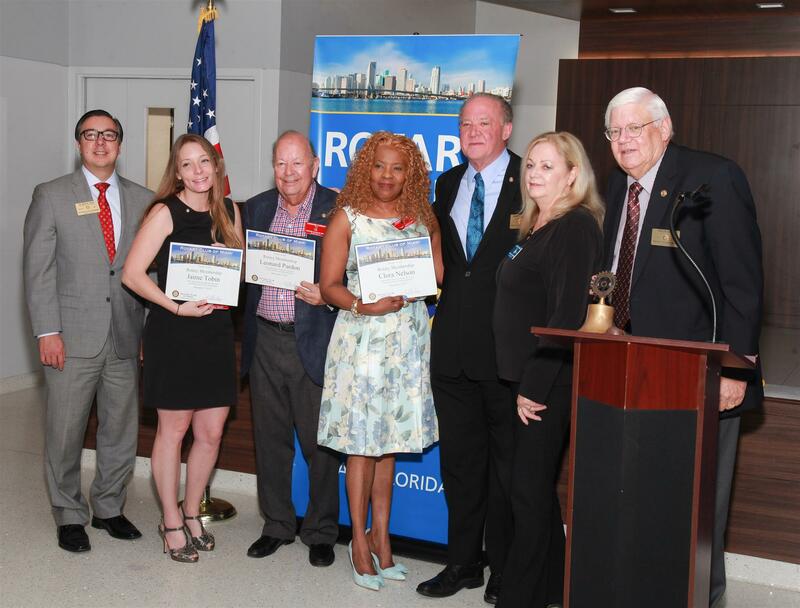 Gregory Herman-Giddens, Nelly Anderson, Karla Richey and Susan Lichtman were installed as the newest members of our Rotary Club on Saturday night August 12. Great news ! 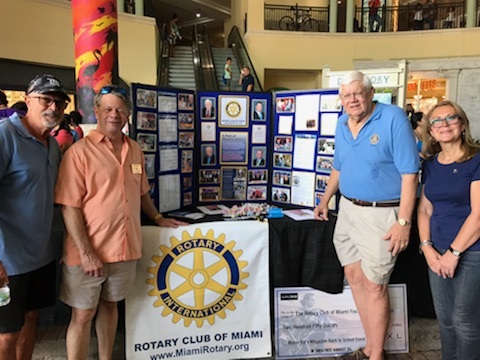 The Rotary Club of Miami is now part of the AmazonSmile network. 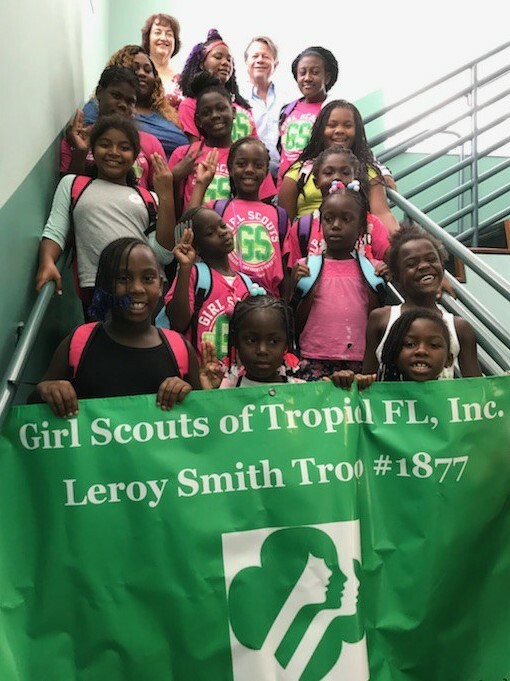 Every time you shop at AmazonSmile you benefit the TBM Medical Scholarship Trust through our Rotary Club of Miami Foundation. Scroll down to connect to AmazonSmile and start shopping ! 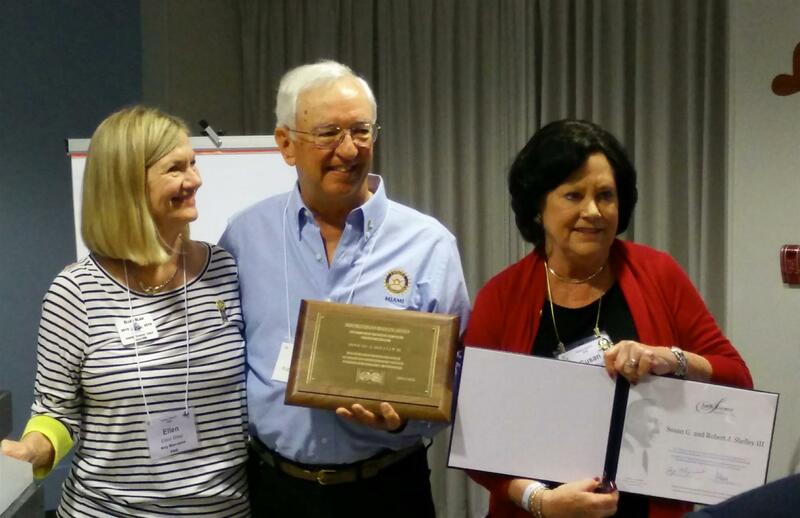 At the 2015 District 6990 Conference, Robin & Susan Shelley were honored for their Arch C. Klumph Society induction. 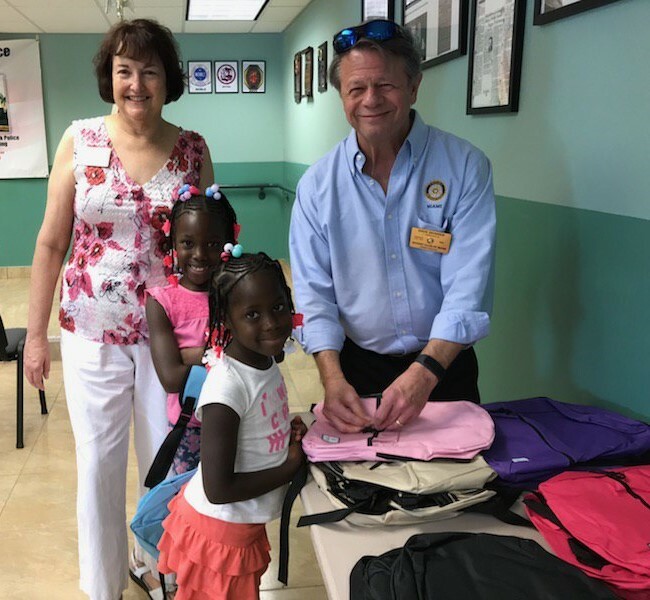 Robin Shelley also received the Distinguished Service Award presented by the trustees of The Rotary Foundation "In recognition of outstanding efforts to promote the Foundation's many programs dedicated to international understanding". 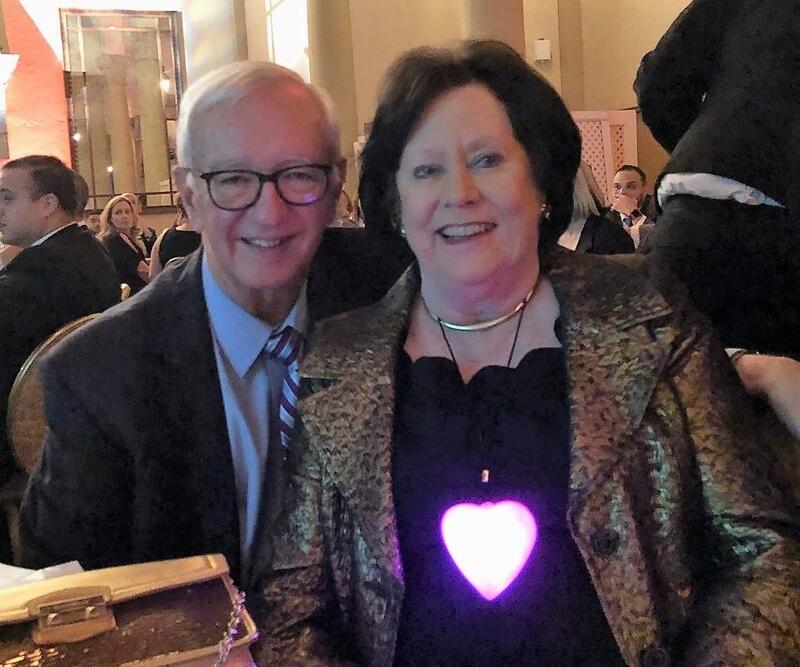 The Rotary Club of Miami's own Robin & Susan Shelley at their Arch C. Klumph Society induction ceremony at the Rotary International headquarters in Evanston, Illinois. 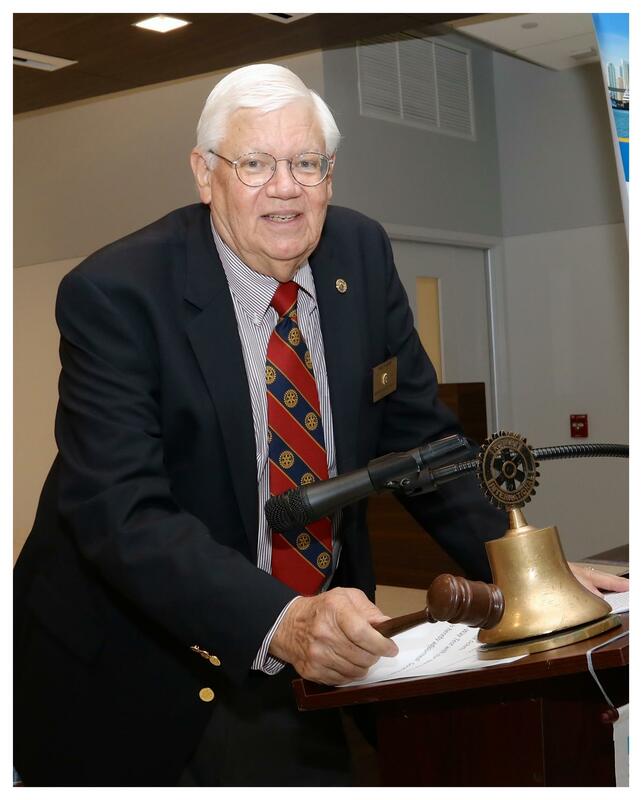 This award recognizes major donors to the Rotary Foundation. Click here for information about the Arch C. Klumph Society. 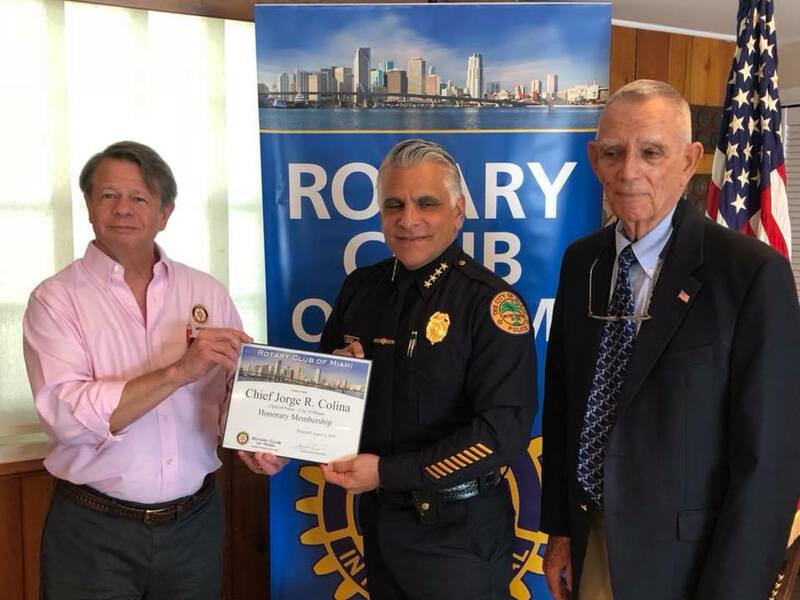 President Dave Skinner and Past President Norm Kassoff induct Miami Chief of Police Jorge Colina as an Honorary Member of the Rotary Club of Miami.